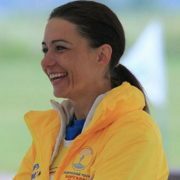 Irina Sinitsyna (March 28, 1977 – October 1, 2012) was a World and European skydiving champion, one of the best Russian skydivers. She was awarded medals 100 years of the Air Force and For strengthening military cooperation. Her sport achievements begin with the words first, only and multiple. Under direction of Irina, women’s team Pearls of Russia built in the sky unimaginable shapes, collecting all the possible award, setting new world records. 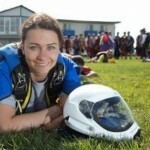 This strong and nice woman’s proved to the world that Russian sky divers are one of the best athletes in the world. 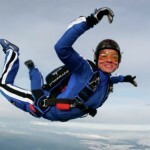 Irina, the future champion of all possible championships and competitions, was interested in skydiving since her childhood. The schoolgirl was intrigued by the exploits of a parachutist from the book The Fourth Height and began to jump with a parachute. As often happens, on the way to the target a lot of obstacles appear. After the collapse of the Soviet Union she had to forget about parachuting. A student of the Academy of Management Sinitsyna got a job of a waitress. In order to improve skills Irina spent 8 months in Italy. In ten years the purposeful girl became the director and finally realized her dream – she opened her own restaurant. A few years later Irina’s son needed a serious and risky operation (he suffered from cerebral palsy). The only specialist that could help a child was found in Switzerland. Fortunately, the operation was successful, but because of some financial difficulties Irina had to sell the restaurant. In a difficult period of her life, Sinitsyna became engaged in parachuting. Only in the sky she could escape from the problems. 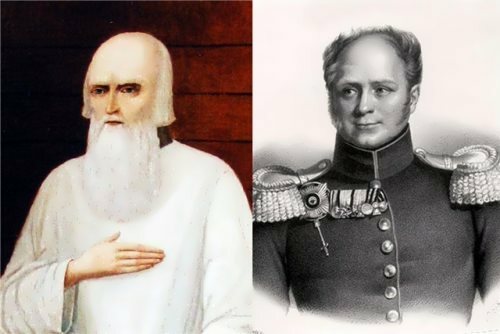 Irina became the captain of Pearls of Russia and was nicknamed Chief. 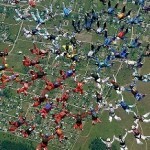 In July 2012 the team set a world record – the flower of the 88 athletes in the sky over the suburbs. Moreover, Sinitsyna was the participant and finalist of the TV show Cruel Intentions (Channel One) and a participant of Fear Factor on NTV. On September 23, 2012 Irina became a participant of an unusual parachuting project in California – the jumpers made a giant rectangle in the air. 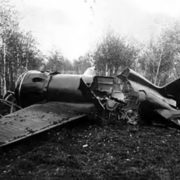 The accident occurred when the parachutists broke formation to open their canopies. Sinitsyna collided with another parachutist, became tangled in her lines and was unable to fully open her reserve by the time she hit the ground. Neither the American nor the Russian doctors were able to save her. It was the last jump for Sinitsyna. On July 13, 2013 in the sky over Kolomna Pearls of Russia set a new world record – one hundred and one girls formed white, blue and red flower. In the white sector was a vacant place, Irina’s place. She dreamed to set this record.